Tomb Raider looks great in 4K – but is that enough? Warner Brothers' 2018 Tomb Raider release is a remake, reboot, rethinking of the Lara Croft films that came before it. It's also an origin story, as well as yet another girl power movie in which the only real alpha being around is on the distaff side of the humanity ledger. Not that there's anything wrong with that, of course. But wouldn't it be a laugh if Hollywood had given the new Lara Croft the gender bending Ocean's 8 or Ghostbusters treatment and made her an Asian heterosexual male? I can imagine the heads exploding! On the upside, Tomb Raider is also another great example of how good a film can look when given the 4K UHD HDR treatment. It's just too bad the writing and some of the production values don't match up to the 4K HDR quality. Alicia Vikander stars as Lara Croft in this outing, replacing Angelina Jolie from the originals. I apparently saw the original Tomb Raider movie on DVD because I reviewed it many years ago, but I remember nothing about it beyond that it was okay. I'd echo that here, both that it's okay and that I probably won't remember much about it in a couple of years. It's fast food, or cotton candy, for the home theatre. Not that that's necessarily a bad thing; we all have guilty pleasure movies and, while this won't be one of mine, judging by some of the reviews I've seen online either a lot of people aren't guilty at all about it pleasing them – or are getting paid to post positive reviews (assuming such a thing happens). Lara Croft is a poor little rich girl, heir to the Croft family fortune but full of enough angst from her past that, rather than use her vast wealth to improve the world (like all good social justice warriors do – except that in this case it would be her own money and not money confiscated from others), she chooses instead to live life as a bicycle courier. This profession obviously prepares her for her Indiana Jones-like swashbuckling. Her father, Lord Richard Croft (Dominic West), disappeared several years earlier, contributing mightily to the protagonist's perpetual pout. And when Lara is convinced finally to sign the papers admitting that her Dad is not just merely dead, but really most sincerely dead, she discovers a rather convenient clue as to what happened to Dear Old and rushes off to find him, rather than finishing signing the papers that would make her extremely wealthy. This leads her into the wild adventure for which the audience has paid its after tax disposable income – a voyage to some secret and special island off Japan that's so hard to get onto that no one does, except for those who have. And guess who does! I won't spoil the plot any more for you by revealing more than that. It's an interesting enough yarn, with enough action to keep action fans happy, but it's nothing you haven't seen before – many times – in this type of movie. The problem is that it needed someone like a Lawrence Kasdan behind the word processor (think "Raiders of the Lost Ark"). It also needed more believably rendered computer-generated effects and locations. What they have are quite lovely to look at, but they don't look real. It reminded me of a 2018's version of the volcanic island Bali Ha'i from the 1958 movie of South Pacific, but without that movie's stupid coloured filters. There were more than a few plot holes in Tomb Raider, too. Plot holes don't necessarily mean that a story falls flat on its face: I defy you to find a Star Trek movie, for example, that doesn't have plot holes big enough to drive a starship through. But Tomb Raider didn't cause me to suspend my disbelief as willingly as Star Trek does (usually), thanks to the fact that I wasn't caught up in the story enough to not think about such things. For example, once they've raided the tomb, they have to get out again (well, some of them do) yet on the way in they managed to set off enough booby traps to make leaving again pretty challenging. One floor, for example, fell away during their entrance and – very handily – I didn't notice it again as Lara made her escape, leaving me to assume it must have healed during the time the Croft Brigade was inside – or that they could really LEAP tall buildings in a single bound. Sorry, wrong franchise. And the bad guy, who's escaping with some horrid zombie-like virus he has in a plastic bag in his pocket, gets the plastic bag shoved into his mouth, upon which time he begins succumbing to the virus that was perfectly safe while it was in the same plastic bag as long as it was in his pocket. Huh? Does plastic dissolve immediately upon contact with saliva? The trip inside the temple is quite reminiscent of the trip into the place in which the Holy Grail was hidden in "Indiana Jones and the Last Crusade," except that this one is bigger and grander, but not as believable. But hey, what do you want from a video game? As an example of the 4K disc market, Tomb Raider is darn good, however. The 4K picture, with High Dynamic Range, is simply lovely, with fine, fine detail in abundance and the kind of contrast and black levels that, like a good movie should, leaps off the screen. This is particularly handy in the dark scenes (inside the big temple, etc. ), because it makes them a lot easier to see reasonably clearly. Audio is Dolby Atmos but Warners also gives you the choice to use a dedicated DTS HD Master Audio track which, since I don't have Dolby Atmos capability in my home theatre, is the choice I used. And it's a very good soundtrack. Dialogue is clear and clean, mostly, and the overall soundtrack is big and bold, making excellent use of all the home theatre's audio channels. The musical score is very percussion-heavy (I guess it's easier to fire up the tympani than to actually orchestrate something) and while I found this quite annoying it does work well if you're auditioning your sound system and I just may use this disc for that purpose when I review audio equipment in the future. And of course, there are extras. Warners' 4K disc set comes with a Blu-ray and a digital download code. The special features, which are on the Blu-ray, include "Lara Croft: Evolution on an Icon" (pretty self explanatory – thought it's cool to see the evolution of the games' graphics! 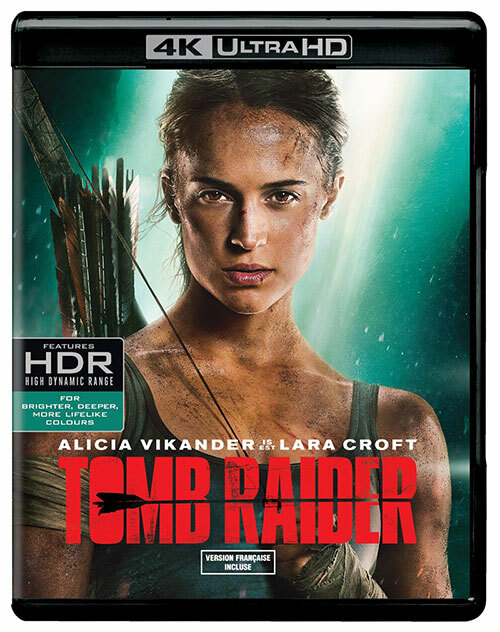 ), "Croft Training" (Alicia Vikander's training regimen for the role), "Tomb Raider Uncovered" (cast and crew reminiscing about the film's creation) and "Breaking down the rapids" (director Roar Uthaug and others detailing the very unbelievable – though cool – sequence in which Croft goes over a gigantic waterfall and lives, thanks to what appears to be a CG version of a crashed WWII bomber). It's interesting stuff, and far be it for me to pooh-pooh extra value in a package, but like the movie there isn't much substance to it. But I sure did enjoy the visual feast of the 4K HDR presentation. Remember, to enjoy a 4K UHD HDR disc properly, you not only need a 4K TV, you also need a 4K player and high-speed HDMI cable, all of which also support HDR. Fortunately, these aren't hard to find these days.